Organized jointly by the Fundaçao Memorial da América Latina and the Proyecto Hélio Oiticica (both Brazil). Exhibited were works by the artist from various creative phases, including his Bólides and Parangolés (chiefly robes worn at Samba festivals which transformed the wearers into living sculptures). Hélio Oiticica was born in Rio de Janeiro in 1937 and died there in 1980. He lived in Washington from 1947 to 1950, in New York from 1970 to 1978. He was an artist, theoretician and poet and is one of the most important exponents of the Brazilian avant-garde of the sixties and seventies. 1992 Retrospective. 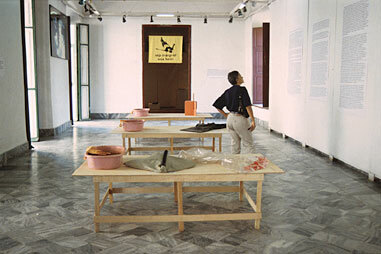 Witte de With, Rotterdam; Galerie nationale de Jeu de Paume, Paris; Fundació Antoni Tàpies, Barcelona; Centro de Arte Moderna da Fundação Calouste Gulbenkian, Lissabon; Walker Art Center in Minneapolis.